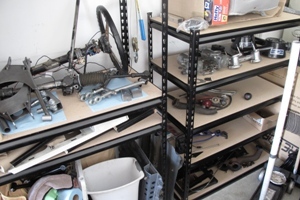 It turns out there are roughly sixteen million different ways to arrange an MGB pedal box and MGB steering column in a Locost frame, give or take a few thousand. Of those sixteen million, exactly 23 will allow you to install the parts, close the hood, operate the pedals, and still fit gauges in the dashboard. Of those 23, only one will end up with the steering wheel in the exact center of the driver's compartment. After many long hours in front of the computer, I believe we have found that one arrangement. However it's going to be a tight squeeze, and a major test of our rookie fabrication skills. Faced with similar engineering challenges, most M.G. Locost builders would take the stock pedal box and steering column, and put them both up for sale on eBay. A nice set of floor-mounted Wilwoods fits easily in any Locost, leaving all the room in the world for just about any steering column. Problem solved. And that's what I would call real engineering, but of course that's not what we do here. 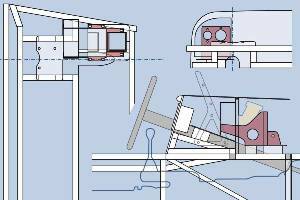 We're building a Locost with parts from a 1972 MGB roadster, and not just a few of them. As many M.G. parts as we can stuff in there. No compromises. So we're doing it the hard way. To fit the MGB pedal box and steering column into the Locost, we're taking a double-decker approach. The pedal box will be raised an inch and a half above the rear engine bay shelf on two 1-1/2" sections of 1/8" wall 3-1/2" square tube, and the steering column will fit more or less underneath it. 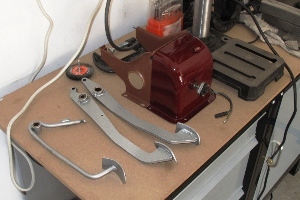 The pedal box will just clear the hood, the steering column will just thread between the P and Q frame tubes, and the clutch pedal will just miss the side body panel at full deflection, at least so long as the pedal bushing is in good shape. I'm sure it'll be fine. Pretty sure. 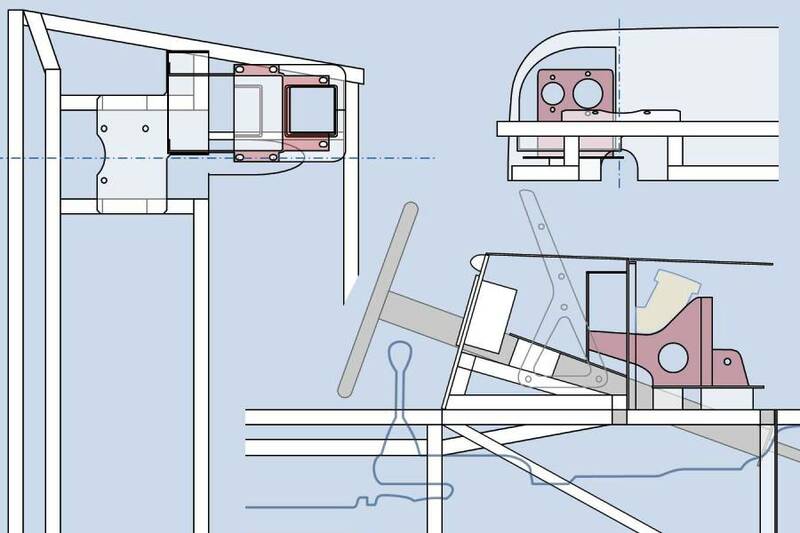 We won't go into all the gory design details here, because for one thing it'll be mind-numbingly boring and for another it likely won't make any sense. Suffice it to say that when it comes time to build the scuttle, we'll take pictures, which won't necessarily make it any clearer, but will definitely be just as boring. Trust me. Meanwhile, we've been preparing the Locost workshop for the major part of the build, i.e. welding up the space frame chassis. 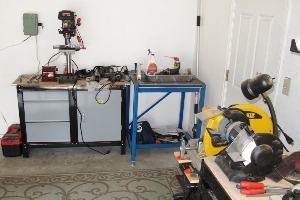 We assembled our second workbench and welding table in a corner of the garage that until two weeks ago was all but hidden by junk. A second workbench was essential for the build, because the original bench was covered with power tools and therefore useless. I figure it should take at least a couple of weeks before the new workbench fills up, after which we should still be able to use the welding table to actually work on things. 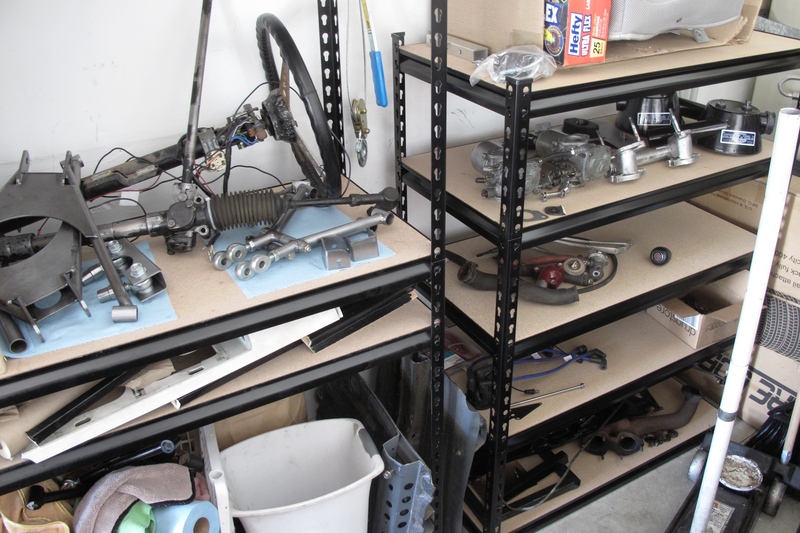 We also built some shelves where we can stash a lot of Locost parts, at least on a temporary basis. These aren't all the parts of course. Some are hidden away in the new workbench and others are scattered around the house. But we know exactly where everything is. Mostly. In any case we're just about done with the parts business, because in a day or two we're pulling the suspension out of the donor, and shipping the remains of the chassis off to the dismantlers. Then the welding begins, and things should start to get exciting again.